I wasn’t aware until recently that airlines have started to strip all the video equipment from their planes and have begun requiring people to bring their own personal devices and headphones in order to enjoy some form of entertainment during a flight. Passengers on United can tap into the Wifi for a price if they want to go online or into the onboard entertainment system signal for free. While the onboard system offers a fairly large library of videos, this development requires people to bring a personal viewing device with a full charge and manage the power so they can watch something for the duration of the travel. 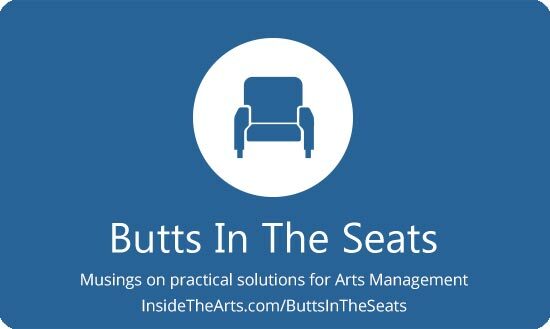 As much as this situation depresses me from the perspective of how much enjoyment is disappearing from air travel, it occurs to me that if airlines normalize this practice for the public at large, it may be possible for arts organizations to extend the “bring your own…” trend for its own uses. The benefit to the airlines is that they don’t have to place television screens on the backs of seats along with all the wiring to serve them. All that is needed is wifi transmitters. In the same way, arts organizations can provide different “channels” of ancillary material in support of a program within their walls. This might be especially useful for museums which may want to provide visitors with a choice of a video talking about the artist, the subject of the painting, the historical period and artistic period in which a painting falls—or the history of the entire museum for those who suddenly find themselves curious in the middle of a gallery. Instead of physically displaying text or a video screen which all those standing before a work must share, the museum can offer any of these immediately upon demand and at the speed the visitor requests. Granted, many museums already offer something similar, but there is always opportunity for refinement and scaling things up. A performing arts organization might offer similar supporting materials during a pre or post show event or on demand as the audience files in prior to the show. However, there might be a bigger benefit to performing arts venues. As I was thinking about possible opportunities, I recalled something Alan Brown said about how a venue might need five or more rooms to meet the different expectations people how about what their experience would be. He said he asked them to describe what they would envision as a perfect jazz club. They said it would be a coffee house during the day but a bar at night with a separate room where those who wanted to be full immersed in the music could go. However, there would also be an anteroom where people could talk with friends and still listen to the music and still another anteroom where people could interact with friends more and listen less. It seems like a tall order to design a building to provide this experience. However the impression I took away from what Brown had to say was that people at every age really desire an experience at an intermediate stage between listening to a recording and fully attending a formal concert. He described this as a place to drop in and hang out and get more information. That was from a post I wrote seven years ago. Since then, technology has advanced to the point where a venue need not provide five different rooms to cover all expectations. If people got used to the idea of bringing a personal device with them they could sit in a single additional room with friends and simply chat with the music coming faintly from the performance space. They would have the option of turning part or full attention to the video and audio feed coming from the other room via their personal devices without leaving their friends. This provides a fair bit of flexibility to a performing arts entity because they can provide a performance in a number of venues without needing to bring video monitors or audio equipment to create a listening experience where the visibility and volume suit everyone equally. They might still have to haul wifi nodes around with them, but it can be easier to set up and there is a fair possibility a venue may already have an in-house system. The thing I don’t like about this idea is that it validates experiencing a performance through a meditating device over the value of attending live. The way live performance attendance becomes valuable is when the accompanying materials or information stream being provided is only available during the live performance. For example, a simulcast from backstage where the audience can witness every entrance and exit, set change, interaction. Though there is a danger that knowing you are always “on” might inspire more interesting performances backstage than on stage. Info You Can Use: Do You Know The Value of A Volunteer’s Time?